Description: Mytee Side-Kit Tarps are designed to be used on a 48-Foot trailer, 102 inch wide (or 96" Wide if selected) with a side-kit system of 30 Inch bow height. It is designed with reinforcements in all the high abrasion areas. Our stock color is black. The tarp has a back drop panel and D-Rings all the way around. 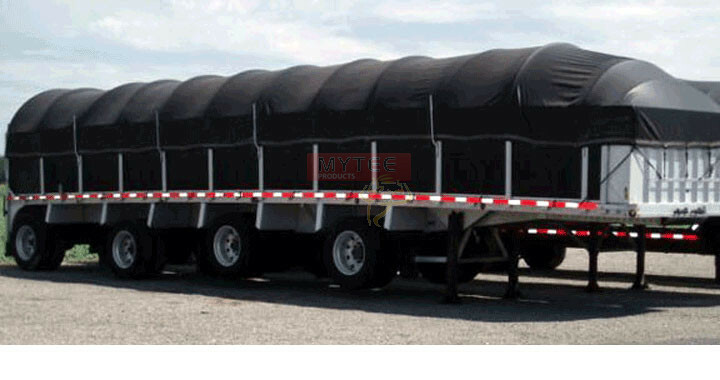 96”- This Tarp fits standard 48 foot long trailers of 96” width with bulkhead compatible with 96” wide trailers. We recommend you verify that the distance from the outside of the rub-rail to the outside of the other rub-rail is 96” and no more. The standard bulkhead sits on the inside of the trailer. It must not overhang outside the main trailer body. 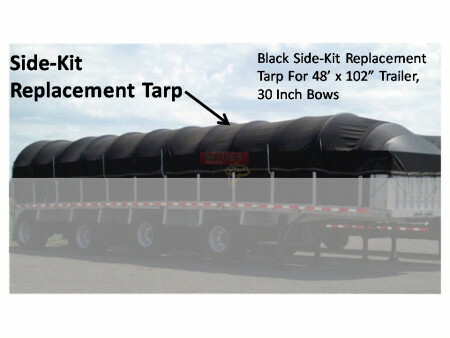 102”- This Tarp fits standard 48 foot long trailers of 101” width with bulkhead compatible with 101” wide trailers. Please verify that the distance from the outside of the rub-rail to the outside of the other rub-rail is 101” and no more. The standard bulkhead sits on the inside of the trailer. It must not overhang outside the main trailer body. If your trailer is a custom trailer or your bulkhead is a modified headache rack or any other customized equipment, we recommend you buy only based upon your own personal knowledge of compatibility.